Sue Wilson Dies - Festive Collection Merry & Bright. Craft Dies by Sue Wilson are an elegant collection of high quality steel designs designed to co-ordinate with each other. Decorate your Christmas cards and layouts with this festive text: "Merry & Bright". Size approx 2.5" x 2". Festive Collection - Merry Christmas Trim. 1 die. Size: 3.35" x 0.94". This die set will create a whole card, or use the individual elements to vary your style. The mosaic frame is perfect for experimenting with colour. Includes 4 dies. Size: 6.6 x 5.3 inches. Sue Wilson Dies - Frames & Tags Collection Noelle Frame. Craft Dies by Sue Wilson are an elegant collection of high quality steel designs designed to co-ordinate with each other. Decorate your Christmas cards and layouts with this Noel frame. Size approx 4" x 4.75". 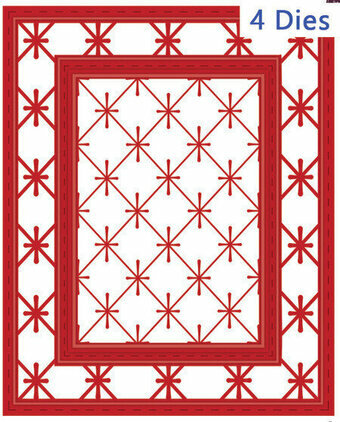 Festive Collection - Poinsettia Corner, Border and Tag. 7 Dies. This versatile set of dies can completely cut out the design when you use them in combination with the silhouette die included with each shape or if you use it without the silhouette die it will cut beautiful shapes into your cardstock. The tag die has a 3rd die that will cut the center of the tag. You have a variety of combinations to use these dies so that each card can be lovely and unique. See example cards in the image gallery above. Sizes: Border: 1.54" x 6.06", Corner: 1.54" x 1.34", Tag: 3.78" x 1.69". Sue Wilson Dies - Festive Collection Santa's Reindeer Snow Globe Scene. Craft Dies by Sue Wilson are an elegant collection of high quality steel designs designed to co-ordinate with each other. Decorate your Christmas cards and layouts with this snowglobe scene. Size approx 3" diameter. Festive Collection - Snow Globe. 2 dies. Size: 3.15" x 4.57". Mini Expressions are perfect small additions to your holiday cards. Includes 1 die. Size: 3.5 x 1.7 inches. Sue Wilson Dies - Festive Collection Stained Glass - Poinsettia. Craft Dies by Sue Wilson are an elegant collection of high quality steel designs designed to co-ordinate with each other. Decorate your Christmas cards and layouts with this stained glass poinsettia. Size approx 3.25" x 4.25". Sue Wilson Dies - Festive Collection Stained Glass - Robin Redbreast. Craft Dies by Sue Wilson are an elegant collection of high quality steel designs designed to co-ordinate with each other. Decorate your Christmas cards and layouts with this stained glass robin. Size approx 3.25" x 4.25". Sue Wilson Dies - Festive Collection Tidings of Comfort and Joy. Craft Dies by Sue Wilson are an elegant collection of high quality steel designs designed to co-ordinate with each other. Decorate your Christmas cards and layouts with this festive text "Tidings of Comfort & Joy". Size approx 3" x 2". Sue Wilson Dies - Festive Collection Twinkle Star Frames. Craft Dies by Sue Wilson are an elegant collection of high quality steel designs designed to co-ordinate with each other. Decorate your Christmas cards and layouts with this twinkle star frame. Size approx 6.75" x 5". Festive Collection - Warmest Wishes. 1 die. Size: 2.56" x 1.73". Sue Wilson Dies - Atlantic Ocean Collection - Azores. This whole collection has a modern feel to it and would work well with male projects too! This one includes a filigree and lattice outside layer. Lots of dies are included for added flexibility and layering options! 5 dies. Size: Smallest: 2.55" x 1.30", Largest: 4.57" x 3.90". An elegant collection of high quality steel dies designed to coordinate with each other. Sue Wilson Dies - Atlantic Ocean Collection - Background. A beautiful modern-looking background that would work for male/female cards. It has inlaid beautiful scallops with cutouts that would add to an interesting focal point. A nice size for 5"x 5" cards. Includes 5 dies for added layering and flexibility! 5 dies. Size: Smallest: 1.75" x 1.75", Largest: 4.92" x 4.92". An elegant collection of high quality steel dies designed to coordinate with each other. Sue Wilson Dies - Atlantic Ocean Collection - Cape Verde. This whole collection has a modern feel to it and would work well with male projects too! This one includes a filigree outside layer. Lots of dies are included for added flexibility and layering options! 6 dies. Size: Smallest: 1.90" x 0.80", Largest: 4.37" x 3.43". An elegant collection of high quality steel dies designed to coordinate with each other. Designed by Sue Wilson these cutting dies are an elegant collection of high quality steel designed to co-ordinate with each other. Contains 6 dies. Size: 3.98" x 3.98". Creative Expressions Necessities Collection Baby's First Pram. An elegant collection of high quality steel dies designed to co-ordinate with each other. This set includes everything you need to celebrate a new baby. Build a pram, and don't forget to add the sweet teddy bear. Perfect for baby showers. Designed by Sue Wilson. Includes 12 craft dies. Size: 2.8 x 2.8 inches - 0.4 x 0.4 inches. Sue Wilson-Background-Butterfly Frame. Designed by Sue Wilson these cutting dies are an elegant collection of high quality steel designed to co-ordinate with each other. 6 dies. Sizes: Outside Butterfly Frame: 5.0" x 5.0", Butterfly: 1.10" x 1.40". These diamond squares make an interesting background. Try mixing and matching background colors for a subtle textured effect, or a more dramatic design. Craft Dies by Sue Wilson are part of an elegant collection of high quality steel dies designed to coordinate with each other. Includes 1 die. 5" x 5". This leaf background creates a lovely silhouette that is perfect for your Autumn-themed projects. Try it with double-sided tape and glitter or gilding flakes for a beautiful background. Includes 1 die. Size: 3.23 x 4.49 inches. Designed by Sue Wilson these cutting dies are an elegant collection of high quality steel designed to co-ordinate with each other. Contains 4 dies. Sizes: Smallest die: 1.75" x 2.60", Largest die: 4.20" x 5.10". Californian Collection - San Francisco (3 pieces). Size: Largest 4 1/8" x 4 15/16". Creative Expression Craft Dies can be used in most leading die cutting machines including the Press Boss, the Grand Calibur, Cuttlebug, Big Shot and eBosser. Finishing Touches - Camellia - Complete Petals. 31 piece die. Sizes: Large flowers 1 1/2" x 1 1/2", small flowers 1/2" x 1/2", Large leaves 1 1/16" x 11/16", small leaves 13/16" x 1/2". The Camellia Dies feature five lobes of flowers that come in a range of sizes to fit all of your crafting needs. Can be used alone or with the coordinating open petal style for more versatility. Sue Wilson Dies - Canadian Collection - Background (set of 2). Size: 4 5/16" x 6 5/16". This craft die from Sue Wilson and Creative Expressions features a background pattern. 4 Dies. Debossed background. Approx. size: Die A 4 1/4" x 6 3/8"; Die B 3 7/8" x 5 3/4"; Die C 2 5/16" x 3 3/4"; Die D 3 3/8" x 2". Creative Expressions Shadow Box Collection Celebrations. An elegant collection of high quality steel dies designed to co-ordinate with each other. This shadow box has the inside cutting edges attached so you will have all the opening cut out with just a single pass through your machine. Use the whole set together or separately to make a variety of birthday projects. Designed by Sue Wilson. Includes 14 craft dies. Size: 4.7 x 4.7 inches. Finishing Touches Collection - Classic Fold-over Flowers (set of 2). Fold in half and glue or tape the long edge then roll into a flower. Best used with light weight paper or to achieve a more rounded petal effect as shown on package, die cut with craft felt to prevent creasing then roll up felt as above to create the flower. Finished Flower sizes: Large is approx. 1"; Small is approx. 1/2". Configurations Collection - Charming Lace Trim. Size: 7/8" x 4 7/16". 1 piece. The Craft Dies are an elegant collection of high quality steel designs designed to co-ordinate with each other. Creative Expressions Craft Dies can be used in most leading die cutting machines including The Press Boss, Grand Calibur by Spellbinders, Cuttlebug by Provocraft, Big Shot by Sizzix and eBosser by Craftwell. Sue Wilson Dies - THE CONFIGURATIONS COLLECTION - Petite Arched Adornment. 1 Die Size: 1 9/16" x 3 9/16". Multiples of this die can be cut so that they can be used together to create many configurations. Sample configurations are shown on the packaging. Sue Wilson-Configurations Collection-Sunrise Adornment. Designed by Sue Wilson these cutting dies are an elegant collection of high quality steel designed to co-ordinate with each other. 2 dies. Sizes: Outside Frame: 3.60" x 1.45", Inside Adornment: 3.40" x 1.20". Sue Wilson Die Corvus. 3 dies. 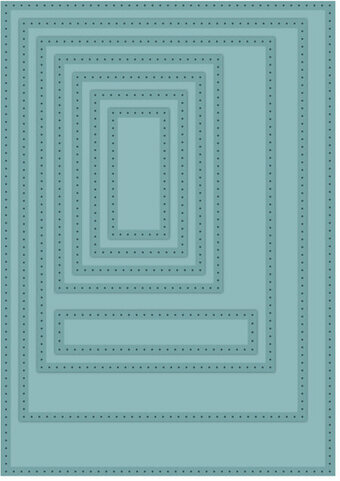 Size: 1.46"w x 6.42"h. Creative Expressions Craft Dies can be used in most leading die cutting machines including The Press Boss, Grand Calibur by Spellbinders, Cuttlebug by Provocraft, Big Shot by Sizzix and eBosser by Craftwell. Sue Wilson Dies - Frames and Tags Collection Daisy Circle Die. 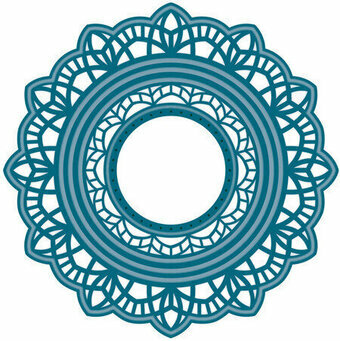 This die has been designed with an inner and outer decorative die feature that line up to complete the daisy motif. Also, the inner circle looks lovely when cut in half and used as a side border too. Designed by Sue Wilson these cutting dies are an elegant collection of high quality steel designed to co-ordinate with each other. 3 dies. Size: 3.94" x 3.94". Sue Wilson -Finishing Touches-Delightful Daisies. Designed by Sue Wilson these cutting dies are an elegant collection of high quality steel designed to co-ordinate with each other. 4 dies. Sizes: Smallest: 0.75" x 1.25", Largest: 1.25" x 3.0". Sue Wilson-Noble Dies Collection-Double Pierced Ovals - Set B. Designed by Sue Wilson these cutting dies are an elegant collection of high quality steel designed to co-ordinate with each other. 9 dies. Sizes: Smallest: 1.10" x 2.25", Largest: 6.0" x 7.20". Sue Wilson Die Double Pierced Squares - Set B. With a larger size in mind, the Noble Dies have been designed to add frames to your card projects. With 10 dies in each set, these dies offer great value and numerous sizes to experiment with. These sets will give you the cuts that fit in between the previous released sets. If your budget stretches to both sets, then you will be able to mat and layer at 1/8th inch intervals. This allows for a more precise matting and layering and the options for frame making have just gone up. 10 dies. Size-1.46"w x 1.46"h to 7.36"w x 7.36"h.
Sue Wilson-Noble Dies Collection-Essential Sized Rectangles (A5, 5 x 7, A6, A7). Designed by Sue Wilson these cutting dies are an elegant collection of high quality steel designed to co-ordinate with each other. 8 dies. Sizes: Largest: 5.90" x 8.25". Expression Collection - Ornate Oval - Just for You. Size: 3 9/16" x 2 5/16". 4 piece die. The Craft Dies are an elegant collection of high quality steel designs designed to co-ordinate with each other. Creative Expressions Craft Dies can be used in most leading die cutting machines including The Press Boss, Grand Calibur by Spellbinders, Cuttlebug by Provocraft, Big Shot by Sizzix and eBosser by Craftwell. Expression Collection - Scripted Happy Birthday. Size: 3 1/5" x 2 3/8". 1 piece die. The Craft Dies are an elegant collection of high quality steel designs designed to co-ordinate with each other. Creative Expressions Craft Dies can be used in most leading die cutting machines including The Press Boss, Grand Calibur by Spellbinders, Cuttlebug by Provocraft, Big Shot by Sizzix and eBosser by Craftwell. Expression Collection - Congratulations 1 Die Size: 3" x 7/8" (approx.). 1 piece die. The Craft Dies are an elegant collection of high quality steel designs designed to co-ordinate with each other. Creative Expressions Craft Dies can be used in most leading die cutting machines including The Press Boss, Grand Calibur by Spellbinders, Cuttlebug by Provocraft, Big Shot by Sizzix and eBosser by Craftwell. Sue Wilson Dies - Expressions Collection Birthday Wishes Die. A beautiful sentiment die that includes a bigger "Birthday" word. A great size that would make this a beautiful focal point on it's own for your card or layout. This die can be used both as a positive and a negative as there is no fall away pieces to it. Designed by Sue Wilson these cutting dies are an elegant collection of high quality steel designed to co-ordinate with each other. 1 die. Size: 2.44" x 1.54". Sue Wilson Dies - Expressions Collection Christening Day Die. The words have all been done separately so they can be mixed and matched for different uses too. On your christening day can be used with or without the cross (CED23003) depending on your needs. Designed by Sue Wilson these cutting dies are an elegant collection of high quality steel designed to co-ordinate with each other. 2 dies. Size: 2.83" x 1.73". Sue Wilson Dies - THE EXPRESSIONS COLLECTION - Just a Note. 1 Die. Size: 2 9/16" x 1 3/8". The Festive Collection (8 piece die set). Size: Largest Poinsettia 3 1/8" x 3 1/8". An organically drawn poinsettia so it is very lifelike in its appearance. 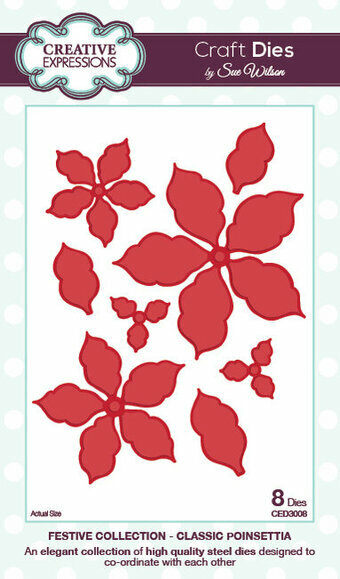 It can be used with matching stamps to add detail or under either of the more decorative poinsettia versions for tonal looks. 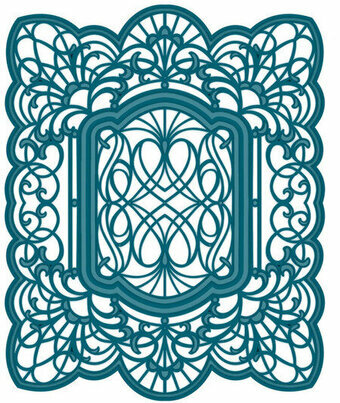 The Craft Dies are an elegant collection of high quality steel designs designed to co-ordinate with each other.nCreative Expressions Craft Dies can be used in most leading die cutting machines including The Press Boss, Grand Calibur by Spellbinders, Cuttlebug by Provocraft, Big Shot by Sizzix and eBosser by Craftwell.